Having talked about the Sun, the Moon and Mercury, let’s proceed to Venus in our student's quest. 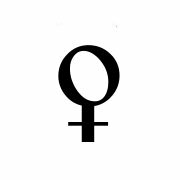 The symbol of Venus contains a circle of spirituality on top, combined with the cross of matter underneath it. It symbolizes the exercise of control over material things based on personal values. It is different from Mercury in the sense that it is not receptive to the information from above; it is rather contained in the self and oriented to what she wants instead of what others want. Venus rules the natural beauty, the hormones and the thyroid gland, which brings balance to the nervous system. It creates wellness and tends toward comfort and passivity. It shows how correlated we are with others, how we express our love and how we accept it. It is affectionate, demonstrative and refined. It is the hope and the joy of being between other people to receive love and joy. It is our aesthetic values and how they correlate with material things and in what degree we desire to possess or consume them. It is associated with art, music, food, decoration objects or objects of comfort. It represents our behavior towards money and material security. It wants to introduce wellness, harmony and beauty in life. As a person or a profession, Venus is associated with young women, aesthetics, hairdressers, middlemen (associated with Mercury as well, but here they are meant to be oriented towards public relations), artists, decorators, florists, stockbrokers, bankers, accountants, ambassadors (also influenced by Mercury) and builders (who obviously have qualities of Saturn, but here appear related primarily to the subject of property). They can also be models, dancers, fashion designers and singers. Venus as a location is associated with areas of public relations, as well as those where social events are held, or the living room where we welcome the world at home, or places of natural or artistic beauty or artistic action sites. In political astrology Venus is associated with arts, fashion, social status. It also affects the law and economics. From a psychological point of view, Venus symbolizes those instinctual behaviors which lead an individual to express preference inside a community (or herd) for a particular opinion or against it. This preference usually acts as unifying factor as it leads to unification with other people who have similar "preferences." Venus prefers belonging to a majority and helps isolating the rebels and the minority. In conscience it manifests as a conscious choice of values, a notion of liking certain things or disliking others, a choice of preferences and impairments. The person with a properly structured Venus is able to find solutions and to cohabit, recognizes and manages correctly the need to unite (and hence may understand the need to attract) and promotes himself in that direction in a balanced way. On the contrary, the improperly structured Venus leads to problems in the picture -- the person thinks it projects outwards and conflicting emotions of depreciation (I don’t deserve love) or ego (I and I alone deserve love). Positive qualities: grace, being sociable, artistic sensitivity, beauty, harmony, affection, companionship, respect, cooperation, love, joy, appreciation, romance, moral values in relationships, moral values in general, happiness, balance, style, good manners, refinement. Negative qualities: indolence, weakness, laziness, temptation, pride, possessiveness, materialism, use of feminine charm for material exchange.